Hannah Genders explores the traditions of this festive foliage. If there is one plant we think about at this time of year it’s our lovely holly tree – we associate the red berries and spiky dark leaves with Christmas, for its red berries and leaves are said to depict Christ’s crown of thorns. Holly does have many traditions dating back much further to pagan times, usually brought to life in mummers’ plays and stories surrounding the Holly King and the turn of the year, but for something that is so common in our countryside, it is often over looked –and yet there is a lot to this plant. The common or native holly is called Ilex aquifolium. It has dark leaves that are very spiky at the bottom of the plant but tend to be less so near the growing tips. We often see it as a shrub layer in our traditional oak and beech woodlands where it would have been coppiced, which means cut to the ground, to encourage the new less spiky growth. This was then used to feed cattle during the winter months in barns and sheds, although the berries are toxic to mammals so they would have been removed. One of the great qualities of holly is its ability to adapt; it will grow in most soils apart from a very waterlogged situation and will tolerate full sun, part shade and full shade. It is what is called in ecological terms a “pioneer” species, able to improve the soil and survive in poor conditions which then allow other plants to colonise once it has established. The holly also performs a very important role for birds – the berries, particularly after the first frosts when they become a little more digestible, are a valuable food source during the winter months and this is how the plant spreads its seed to other locations. The dense bushy growth allows small birds to make nests that are protected from predators by the sharp leaves. We had a lovely female blackbird that made her nest year after year in a holly bush by our front door; she seemed quite happy in there and the cats couldn’t get to her. In fact, she was such a regular sight that we named her Holly and looked forward to seeing her rebuild the nest each spring. The hollies seen in hedgerows often mark a right of way like a footpath, bridleway or boundary. They have a long history in our countryside of marking important sites and if you can imagine a world where only holly, ivy and yew were the evergreen plants available, as it would have been years ago, you can understand the importance of them as a marker plant. Quite often a large holly tree will stand above a hedge line of hawthorn or other native shrubs – they were sometimes left uncut because it was considered bad luck to cut a holly down, as they were associated with keeping out witches. From a garden design point of view, holly is an excellent plant. It can be used as an architectural plant or tree, and it can provide a good hedge as it forms a dense screen and very secure boundary. 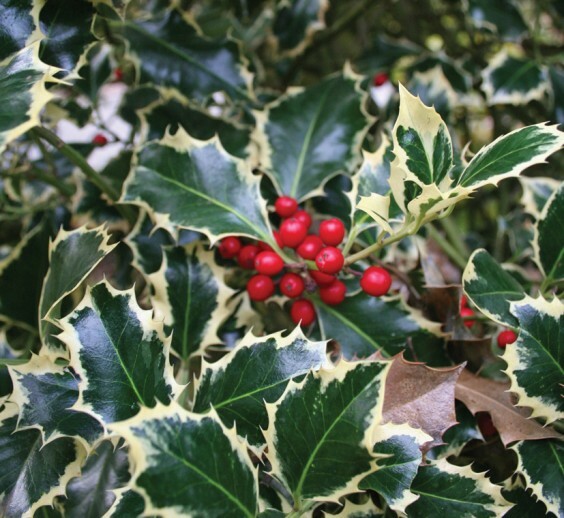 There are hundreds of different types of holly – the aquifolium species has everything from silver variegated leaves to different coloured berries – so it should be easy to find one you like. It is slow-growing so doesn’t require much pruning and it responds very well to being cut back hard. So if you have a hedge that has got much too leggy, don’t be afraid of witches or losing it if you cut it back to regenerate the growth! When planting holly it’s useful to note that smaller plants often take better than larger ones. An ideal and cheap way to buy it at this time of year is as hedging “whips”; these are small bare-rooted twigs sold for less than £1 each. Plant them out with about five to a metre to form a good thick hedge. They may seem to stand still for a few years before they romp away and do you proud. Another tradition during Christmas is to bring holly into the house for decoration. As there are two types of holly, both male and female, the folklore tells us that the first type of holly brought into the house would denote who would rule for the coming year. Just so you know, girls, the female one is the one with red berries! Whichever way you enjoy the holly plant this Christmas, I hope it’s a good one, and a Happy New Year.